Are you looking for Telangana State Law and PG Law Common Entrance Test Hall Tickets? If your answer is a yes, then very good, Here’s TS LAWCET & PGLCET Hall Ticket 2019. The Osmania University, Hyderabad is providing the hall tickets for Telangana State Law CET-2019 after taking down the applications. On behalf of the Telangana State Council of Higher Education, OU, Hyderabad is going to conduct TS LAWCET/TS PGLCET 2019 Examination. Candidates who look forward to taking admission in 3Year/5Year LL.B. Regular Courses and 2-year LL.M courses in Law colleges of Telangana State can appear in TSLAWCET & PGLCET Examinations which are conducted every year by Osmania University. Before appearing in this entrance examination, download TS LAWCET Admit Card 2019 in online mode from the official website – lawcet.tsche.ac.in. TS LAWCET Exam Notification for the 2019 year is live on the official website. After registration & fee payment, candidates are waiting for the hall ticket download. The officials of Osmania University will release hall tickets for TS Law Common Entrance Test 2019 around 3 days prior to the exam date, as mentioned above. Hall Tickets for Telangana LLB & LLM Admissions shall be accessible online with the help of application number and date of birth of candidates. On the exam date, Candidates must report and appear in the exam centre at the prescribed timings. Entry will be restricted for the candidates who reach late in the examination centre. 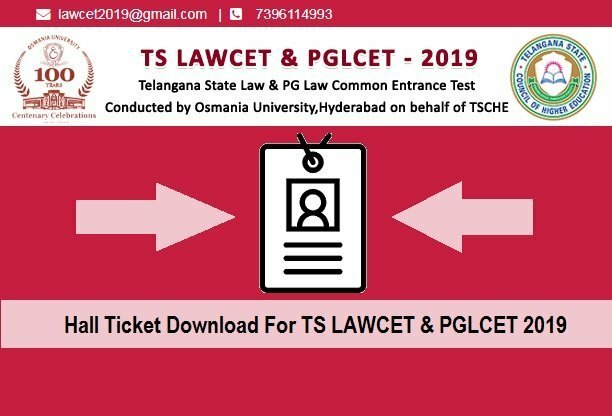 Check the detailed instructions for TS LAWCET & PGLCET Exam 2019 using the hall ticket document. Telangana LAWCET Hall Ticket is a hall ticket for the LAW Entrance Examination. Applicants cannot be eligible to appear in the exam without this hall ticket. Hall Ticket for this exam can be downloaded from the website – lawcet.tsche.ac.in when it is available online. To know the current status of hall ticket, visit the direct link below. Candidates who secure the LAWCET Hall tickets successfully will be called at various exam centres such as Hyderabad, Siddipet, Adilabad, Khammam, Warangal, Karimnagar etc. It is advised to all candidates to bring an identity proof of theirs along with the hall ticket of TSLAWCET 2019. No candidates will be permitted to sit in the exam without a valid Govt Identity. At last, ensure to arrange all your required documents at least one day before the exam to avoid complications at the last time. All the best for TS LAWCET & PGLCET.